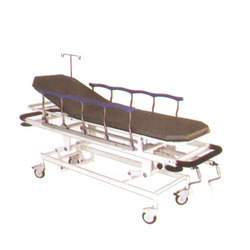 Manufacturer of a wide range of products which include emergency & recovery trolley, stretcher on trolley, stretcher trolley with mattress, folding strecher 4 fold, scoop stretcher (telescopic/immobile) and ambulance stretcher. 4 Removable Swivel castors. 5" dia, two with brake. Pre - treated & Epoxy Powder Coated finish. SS I.V Rod along with provision at two locations. Overall approx dimensions 210 Lx 65 W cms. 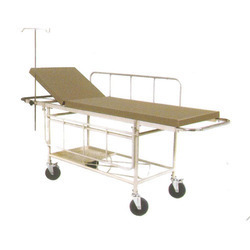 Two section top with removable X- ray permeable stretcher. Removable stretchers top made of M.S Sheet with S.S handle. Pre-treated & Epoxy powder coated. Trolley Mounted on castors with 2 brakes. 1" x 18 G horizontal CRC tubes. Frame work of 1.25" xl 6 G vertical. Trolley Mounted On 15 cms dia castors with 2 brakes. Swing Away type safety side railing. Frame work made of Tubular M.S Pipe with S.S handle. Cylinder cage, Utility Tray, I.V Rod. 4 Fold, provided with bag. Gross Weight 7 kg Net Weight 6 kg. Load Bearing capacity 159 kgs. 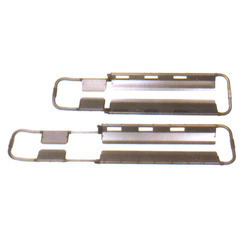 Aluminium folding lengthwise & width wise. 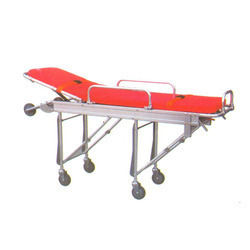 • The stretcher length can be directly transferred into the ambulance. 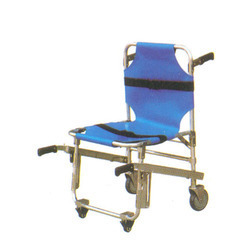 • The stretcher can fold or be separated into two parts, easy to carry or transport. 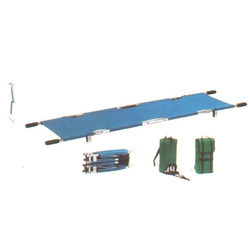 • A portable first aid stretcher is commonly used for transporting bone fractured and seriously injured patients. 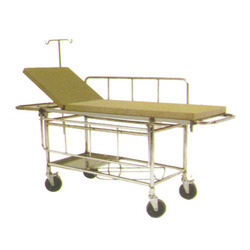 • The hospital bed quickly without moving the patient. • Utilizes High precision mechanical transmission. • Automatically folded through the left & right hand control handle. • Load Weight upto 120 kg. • Product weight :40 kg. • Diameter of castor 125mm. • High quality Aluminium alloy tubes. Made of High quality Aluminium alloy. Mainly used some areas with difficult traffic, narrow halls, and gangways. 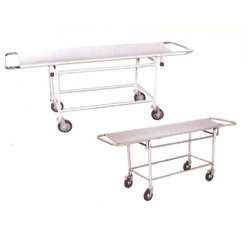 Looking for Patient Transfer Trolleys ?